The Web Marketing Association has extended the deadline to enter the 9th annual Internet Advertising Competition Awards. The new deadline is now February 11th at midnight EST. This will be the only extension as the judging will begin the following Monday. All existing entries can be edited until the new deadline date as well. Best of Show awards for each format will be selected from among the industry winners. Ads eligible for entry in the competition must have run during the period from January 1, 2010 through January 28, 2010, except for the Ads The Client Did Not Choose which do not have to have run. IAC Best of Industry winners will receive a new custom-made IAC Award that uses high quality clear and black crystal, with a custom geometric hand cut shape, and the pieces of black and clear crystal seamlessly fused and polished together by hand. In between the clear and black, the IAC logo is etched on the bottom of the clear piece, creating a beautiful unique design. Personalization is added with a steel plate on the base. It will be an impressive addition to any display case and will make an extraordinary client gift. The New Rules of Selling Consulting Services in 2011 – The economy ups and downs and ups, changes in buyer behavior, the web, social media, sales enablement tools, and increased competition have transformed how and why clients buy. Register and receive a free whitepaper to help you better understand the changing dynamics of selling consulting services. Blogging Success Summit 2011 is a live online conference designed to help you master blogging for business, empowering you to quickly attract and connect with customers (and prospects). The industry’s leading blogging pros will show you how. This fully online conference starts Tuesday, February 1, and runs through February 22. It’s comfortably spread over four weeks (and recorded for later playback) to accommodate your schedule. There’s no travel! You simply attend from the comfort of your home or office. REGISTER TODAY and SAVE 50% PLUS GET $794 IN FREE BONUSES! The Web Marketing Association is please to announce that the Best of Industry winners in the 2011 Internet Advertising Competition will receive a newly updated award from Society Awards in NYC. This custom made award uses high quality clear and black crystal, with a custom geometric hand cut shape, and the pieces of black and clear crystal seamlessly fused and polished together by hand. In between the clear and black, the IAC logo is etched on the bottom of the clear piece, creating a beautiful unique design. Personalization is added with a steel plate on the base. It will be an impressive addition to any display case and will make an extraordinary client gift. The deadline to enter the 2011 Internet Advertising Competition Awards in now less than a month away. Banner ads, email ads, rich media, online newsletters, online video, mobile and online apps, websites and now social media campaigns can be entered in 86 industry categories at www.IACAward.org. 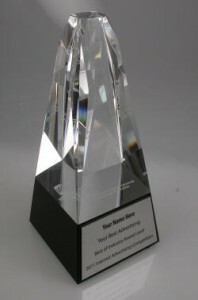 The IAC Awards are the first and only industry-based advertising award competition dedicated exclusively to online advertising and the deadline for entry is January 28, 2011. Don’t miss out! Search Engine Strategies will be held in New York on March 22-26. Our friends at SES are offering a no-cost full conference pass to one member of the Web Marketing Association. If you would like a chance to attend this conference for free, send your contact information, including name, title, company, and address to SES@WebAward.org by February 28th to enter our drawing. Increase your Chances of Winning an IAC Award! Throughout January, we will be publishing insiders hints for increasing your chances to win a IAC Award. Each weekday during January the Web Marketing Association Facebook Page at http://www.facebook.com/WebMarketingAssoc will feature ideas to improve your chances to win the recognition you deserve. Be sure to like the page so updates will show up in your news feed.